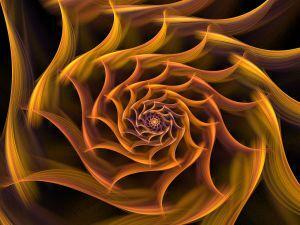 Is the matter in the universe arranged in a fractal pattern? A new study of nearly a million galaxies suggests it is - though there are no well-accepted theories to explain why that would be so. Cosmologists trying to reconstruct the entire history of the universe have precious few clues from which to work. One key clue is the distribution of matter throughout space, which has been sculpted for nearly 14 billion years by the competing forces of gravity and cosmic expansion. If there is a pattern in the sky, it encodes the secrets of the universe. A lot is at stake, and the matter distribution has become a source of impassioned debate between those who say the distribution is smooth and homogeneous and those who say it is hierarchically structured and clumpy, like a fractal. Nearly all physicists agree that on relatively small scales the distribution is fractal-like: hundreds of billions of stars group together to form galaxies, galaxies clump together to form clusters, and clusters amass into superclusters. The point of contention, however, is what happens at even larger scales. According to most physicists, this Russian doll-style clustering comes to an end and the universe, on large scales, becomes homogeneous. But a small team of physicists, including Francesco Sylos Labini of the Enrico Fermi Centre in Rome and Luciano Pietronero of the University of Rome argue that the data shows the opposite: the universe continues to look fractal as far out as our telescopes can see. But Sylos Labini and Pietronero were not convinced. They believed that the apparent smoothing was an illusion caused by weak statistics - the smoothing seemed to occur at the largest scales the survey was capable of studying, where there were too few large regions to be able to reliably compare their densities, they said. Only a bigger map could resolve the debate. Now, SDSS has released its sixth round of data, which plots the locations of roughly 800,000 galaxies and 100,000 quasars, bright objects powered by violent supermassive black holes. And they say if the universe does become homogeneous at some point, it has to be on a scale larger than a staggering 300 million light years across. That's because even at that scale, they still observe large fluctuations - a cluster here, a void there - in the matter distribution. Most cosmologists interpret such fluctuations as being no more significant than small waves on the surface of the sea, but Sylos Labini and colleagues say that these are more like tsunamis. Many cosmologists find fault with their analysis, largely because a fractal matter distribution out to such huge scales undermines the standard model of cosmology. According to the accepted story of cosmic evolution, there simply hasn't been enough time since the big bang nearly 14 billion years ago for gravity to build up such large structures. What's more, the assumption that the distribution is homogeneous has allowed cosmologists to model the universe fairly simply using Einstein's theory of general relativity - which relates the shape of space to the distribution of matter. Modeling a fractal universe with general relativity is possible in theory, but in reality it would be devilishly complicated. That would leave cosmologists without a working model, like acrobats without a net. 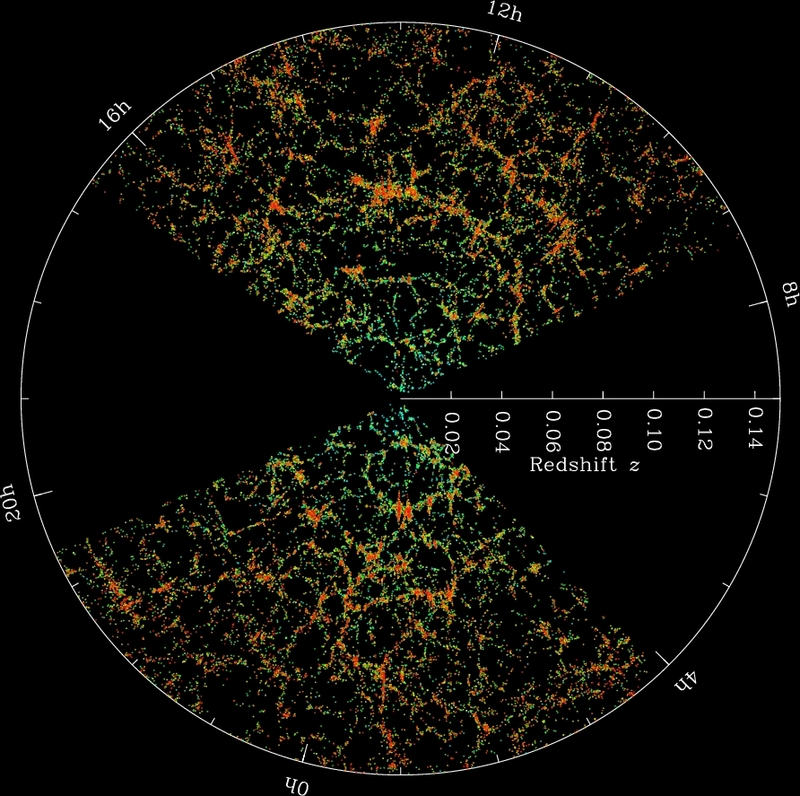 To support the homogeneity assumption, cosmologists point to the smoothness of the cosmic microwave background (CMB), relic radiation from the nascent universe. The CMB is perfectly uniform up to one part in 100,000, suggesting the early universe was nearly homogeneous. "The standard picture of a homogeneous universe on large scales is holding up very well when tested with very large-scale observations like those mapping the cosmic background radiation, X-rays and radio galaxies," says physicist Neil Turok of Cambridge University in the UK. "If the observations of galaxies in optical surveys don't agree, there may be a number of possible explanations, without resorting to an extremely inhomogeneous, fractal universe," he told New Scientist. But inferring the matter distribution from the CMB is not always simple. CMB maps show a 3D distribution projected onto a 2D surface, and it is possible for a clumpy 3D distribution to appear smooth when projected in 2D. The same is true of the X-ray background, which appears homogeneous in two dimensions. Finally, using galaxies that are bright at radio wavelengths is also problematic, as it is difficult to measure their distances accurately enough to pinpoint their positions in 3D. So what could produce such a fractal pattern in galaxy surveys like Sloan? Some of the clumpiness may be a sort of optical illusion known as the Bull's-eye effect, says Adrian Melott of the University of Kansas in the US. That's because nearby galaxies fall towards each other due to their mutual gravitational attraction - even as space itself expands. 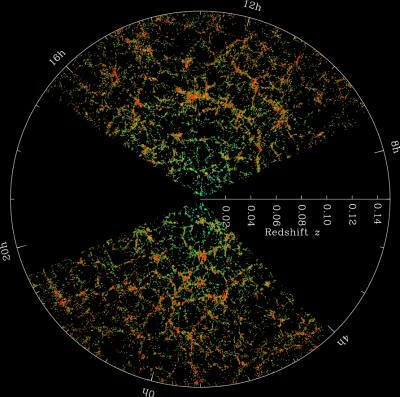 That movement can enhance the apparent clumpiness of matter in surveys like Sloan, since those surveys rely on measurements of the galaxies' velocities to determine their distance from Earth. But according to their paper, Sylos Labini's team says the Bull's-eye effect is only relevant on very small scales, about 16 million light years and below, and has no influence on the clumpiness at the large scales in question. Melott disagrees, saying it should magnify clumpiness at any scale. But he adds that the effect only "enhances structures that [already] exist". What's at stake if the universe is indeed a fractal on the largest scales? Besides a radical rethink of the laws and history of the cosmos, researchers have placed something more down-to-Earth on the line. Should the fractal pattern begin to disintegrate at scales less than 50 million light years, Davis would receive a case of Italian wine - which some would say is a better deal. Turok has yet to declare a winner.